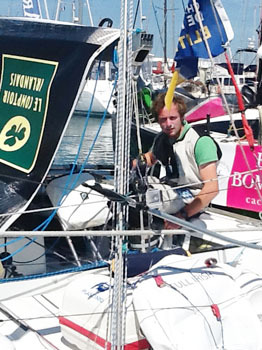 David Kenefick, having sailed singlehandedly for thirteen days, three hours and thirty one minutes over fours legs in the 2014 Edition of La Solitaire du Figaro and in only his second attempt at this world renowned solo race, has finished in 23rd position from the 38 competitors entered. Well done David, we are all extremely proud of you . It is now time for you to enjoy some well deserved rest. Thank you from all who followed your exploits every day from the comfort of home and were filled with admiration at your performance..
With just less than 100 miles to go this afternoon on Leg 4 of La Solitaire du Figaro-Eric Bompard cachemire it may be advantage to Jérémie Beyou (Maitre Coq) as the race leader has his main rivals behind him as he seeks to win this famous solo race for the third time, but the final set of the stage in to Cherbourg-Octeville still has huge potential for upsets. With very strong tidal currents and a breeze which is due to get lighter than the brisk 20kts blast which has finally been enjoyed for the final act of this month long marathon, after the fleet compacted last night at Ushant and again at what was to be the final mark of the race, Manacles, this morning, a thrilling, up- all-night finale is on the cards. To stay high or go low of the fleet, that was just one dilemma facing the fleet, with half the 36 boat fleet within five miles of the leaders. Many last night gained as much as four miles back on the leaders between the Western Sein mark, Ushant and the Portsall marks before spinnakers were set. But the lateral spread, back at 15 miles this afternoon, tells a story of the last strategies. The choice to stay high has been favoured by Yann Eliès (Groupe Queguiner-Leucemie Espoir), Beyou and his pursuer Corentin Horeau (Bretagne Credit Mutueal Performance) whilst Alain Gautier (Generali) in seventh has stayed low. Sam Goodchild (Team Plymouth) has had a solid final day of a race which has been deeply disappointing for him. He said before starting in Les Sables d’Olonne that he had come in less prepared and practised than he had hoped to be due to his 11th hour programme, but he has battled steadily up the fleet, gaining in the fast sailing and brisk winds with some good tactical choices and was up to fourth this morning and sixth this afternoon, just 1.4 miles off the lead, sandwiched between Beyou and Gautier. He looks set to deliver his best result of the race after finishing 31st, 24th and 29th so far. And Ireland’s Dave Kenefick (Full Irish-La Comptoir Irelandais) has slipped slightly but is still holding 16th, two miles shy of a top ten finish. The final tack upwind to Normandy is far from clear, as the latest weather forecasts for the next 24 hours are not as simple as they may appear at first glance. Some are forecasting that the Easterly wind will continue, simply easing off to around twelve knots at the tip of the Cherbourg Peninsula, while others talk about calms developing as they approach the Channel Islands. Some expect the wind to back NE’ly while others are looking at a veer to the ESE as they reach the Casquets exclusion zone. If the easterly wind does indeed ease off, the fleet will be squeezed back together and a slight shift by 10 degrees will benefit those in the north if the wind veers, but those in the south if it backs slightly. High tide is 11:27 p.m. in Alderney (Channel Islands southern DST), there will be contrary current until 6:07am after which the leaders will benefit until around noon. And of course flirting with rocks and counter currents in the breeze, when tired on a third night at sea of the fourth and final leg, will be a real acid test. Going into this last leg Beyou had four skippers within 24 minutes and two seconds of him, Lying fifth on the leg he had Gildas Mahé (Interface Concept)at 0.7 of a mile behind Horeau is ninth at 0.9 of a mile behind and Charlie Dalin (Normandy Elite Team) is in 15th at +2.6 miles behind Beyou. It now all rests in the lap of the Weather Gods and the stamina of the weary competitors. VOLVO Cork Week – Monday is practice day.